ORLANDO, FLORIDA – There’s something about this city that brings out the crazy travel planner in me. I visited here four times betting a shuttle would launch, luckily winning on three occasions. I also once took an epic bus trip from here as far south as Fort Lauderdale before zooming back north, looking at space exhibits up and down the coast. This time, it was to catch the Vehicle Assembly Building tour before it was gone. Tours inside the iconic, huge structure — best known as the spot where the Apollo rockets and space shuttle went through final assembly before going to the pad — are closing down on Sunday (Feb. 23). Warned by Ken Kremer and others that soon the public couldn’t get inside, I booked a ticket late last month after the announcement was made. I came in search of the past, but what I saw instead was the future — an agency preparing to hand over a launch pad to SpaceX, and at least part of an Orion spacecraft on the VAB floor, ready to be shipped to Langley, Virginia. It’s hard to convey the size of one of the world’s largest buildings. It’s so big that it can form its own weather inside, without proper air conditioning. It stands almost twice as high as the Statue of Liberty, at 160 meters (525 feet) tall and 158 meters (518 feet) wide. The 3.25-hectare (8-acre) building needed to be so huge to hold the 363-foot (111-meter) Apollo/Saturn vehicles in the 1960s and 1970s, and then was modified for use of the shuttle in the 1970s until just a few years ago. What surprised me, however, was how narrow the main floor appeared. That’s because there are all of these catwalks on either side of the space for workers to get access to different parts of the spacecraft. Tours of this building were off-limits between 1978 and 2011, when the shuttle program was launching its vehicles in earnest. After the program retired, however, NASA opened the VAB and nearby facilities (including the Launch Control Center and Launch Pad 39A) up to visitors. 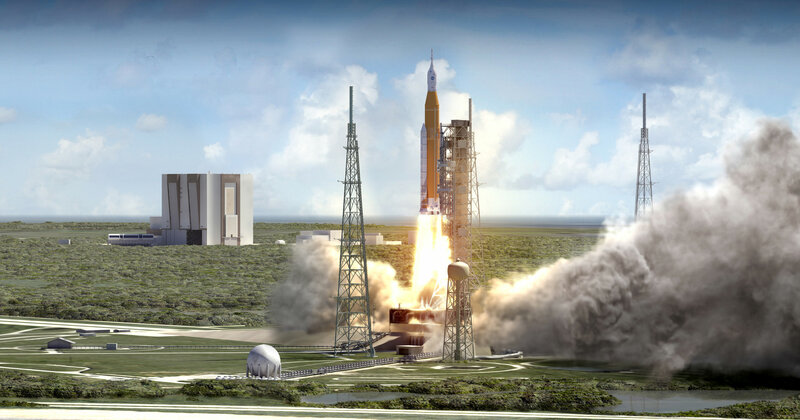 As these areas are now being used by contractors and the Orion/Space Launch System, however, the agency is closing down public access so the work of getting to space can continue. As NASA prepares for a test of Orion later in 2014, the agency is also looking to lease out parts of the big building to commercial vendors. It appears negotiations for at least some of the high bays are ongoing. Meanwhile, we were lucky enough to glimpse at least part of an Orion spacecraft prototype ready for shipping to Langley, Virginia, with about a dozen people busily milling around it as it lay on the back of a tractor trailer. It’s unclear to me how much of the spacecraft was inside that package, but our tour guide told us it was the whole thing. Yes, the truck looked really tiny in the big building. Our group also had the chance to visit Launch Pad 39A, one of the two pads used in the Apollo program and also for shuttle. It was eerie to see the pad still in its shuttle configuration, complete with the clamshell-like structure that used to protect the vehicle from the weather until just prior to launch. All that is going to be torn down for scrap shortly as SpaceX likely takes over the pad, our guide told us, and it’s unclear how long pad tours will continue. Likely those will be gone soon as well. Meanwhile, I took special delight standing in the “flame trench” where noxious chemicals from the launch used to flow. You certainly didn’t want to be close to this spot when a Saturn V or shuttle stack took off. By the way, the first thing I thought of when I saw the huge pipes on the side of the picture below is the 1996 movie Apollo 13, which has a dramatic launch sequence that includes a neat pan across the coolant tubing. That’s about the time when I decided I wanted to see the VAB and launch pads, so it only took me 18 years to get out here. Although these tours are likely changing or closing, these steps are to get the complex ready for manned launches again, if the current plan and funding holds as NASA hopes. In the meantime, there are other things to see at the center. The picture at the top of this article shows the Vehicle Assembly Building just before the launch of STS-129, my first experience seeing a shuttle rocket into space. That shuttle happened to be Atlantis, which today is handily displayed nearby in the KSC Visitor Complex. Weird, I thought, as I looked at the immense vehicle’s bulk. The last time I saw you in November 2009, you were on your way to orbit and making a lot of noise. I wonder how much things will change at KSC in the next four years. How Does the Shuttle Orbiter Get Attached to the External Tank and Solid Rocket Boosters? 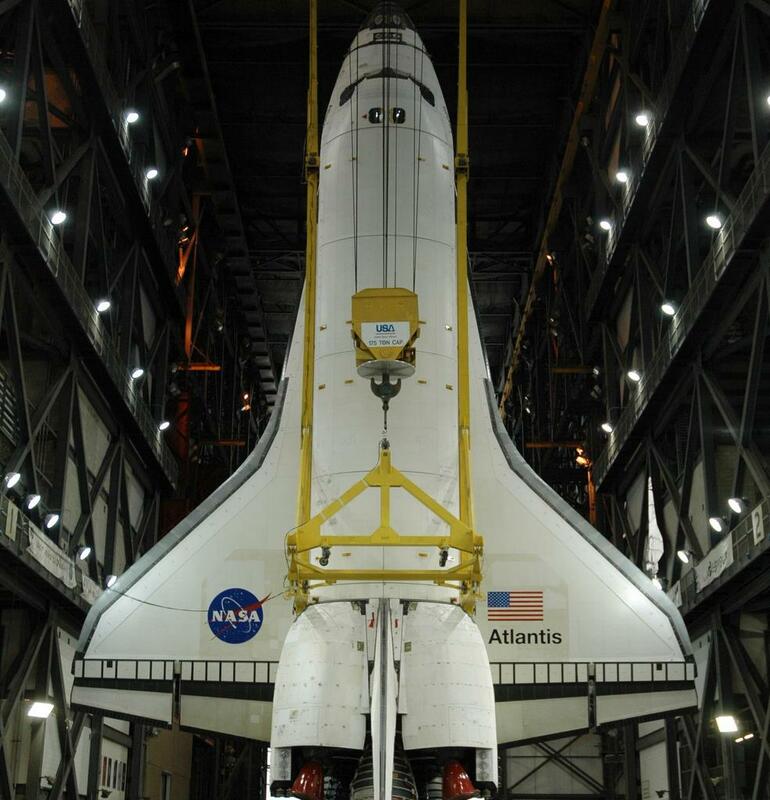 Ever wondered how the space shuttle orbiter gets attached to the big external tank and the solid rocket boosters? 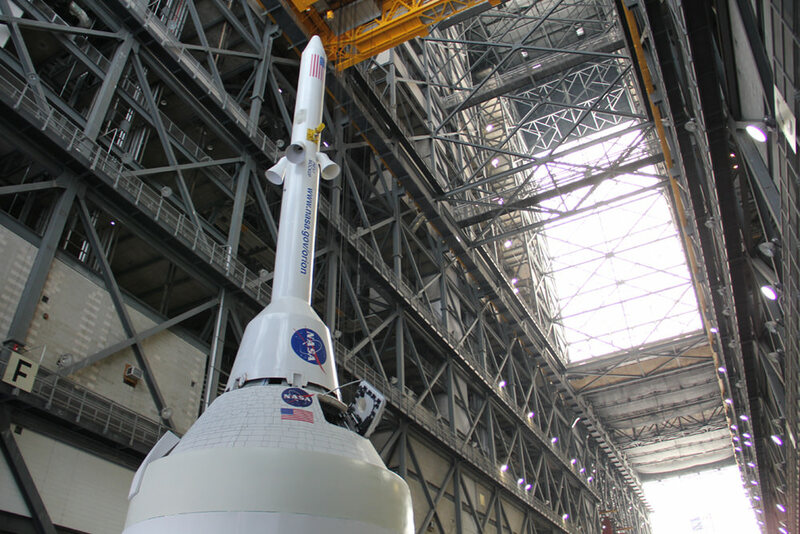 This video shows the process — called “Lift and Mate” — where the shuttle Endeavour was put into a special harness, lifted high above the stacked ET and SRBs inside the Vehicle Assembly Building at Kennedy Space Center, and lowered into place. The orbiter is then bolted to the ET and SRBs. Endeavour’s Lift and Mate for its final flight took place on March 1, 2011. You can also see extremely high resolution, pan and zoom images of Endeavour lifted high in the VAB at the NASATech website. (High bandwidth warning! — but definitely worth it.) See the NASATech main page for the full variety of images. Endeavour is scheduled to rollout to Launch Pad 39A next week for STS-134, with launch set for April 19. Even though this could be the final flight of the shuttle program (STS-135 is still not a certainty) many people are looking forward to this flight, as it will bring the Alpha Magnetic Spectrometer to the ISS. AMS is a particle physics detector designed to search for various types of unusual matter by measuring cosmic rays.